Caring for your stringed instrument will not only keep the instrument looking and sounding great, it will also help hold its resale value. Warped bridges, open seams, cracks, dings, and dents, while often an inevitable part of owning a stringed instrument, a little bit of care goes a long way to minimizing damage. Wood string instruments are a little like children; if you try to force them to do things you will often get negative results. Seriously though, forcing an instrument into a case or forcing stuck pegs to move or the like will almost always end badly. If the soundpost is down, the bridge looks like it will fall over at any minute, the fingerboard is loose or separated, cracks, open seams (especially at the block or neck), or any problem where string tension could cause damage or when in doubt; loosen the strings immediately! This will cause the bridge to fall off which is okay, just put it safely inside the case. Lastly, always loosen the bow when it is not being played. Never hesitate to call us or call your luthier. Below you will find detailed point-by-point discussion of the various issues that arise as an instrument owner. 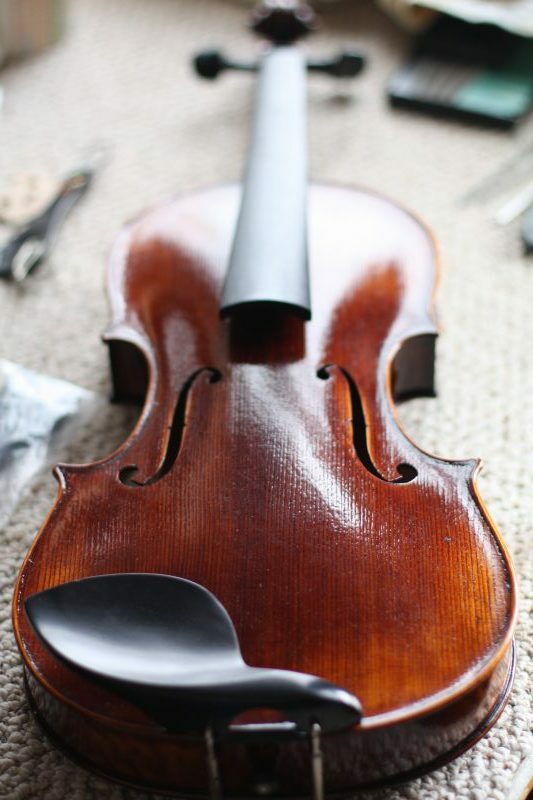 Cleaning and Polishing – The bow wont work without rosin but most of that rosin dust ends up falling onto the top of your instrument where it begins slowly eating its way into the varnish. To keep this from happening it is important to periodically clean the rosin off the top and sides of the instrument, the end of the fingerboard, and the stick of the bow. The best practice is to do this after each time the instrument is played using a soft cloth that has a bit of polish on it. For polish I recommend Gaurdsman Furniture Polish; which is available in many hardware and grocery stores for a fraction of the cost of instrument polish that can be purchased at a music store. Gaurdsman is a concentrate and can be diluted according to directions but I often use it straight out of the bottle in small amounts, it is also wonderful for your furniture, particularly heirlooms. If the rosin is already stuck on and will not come off with polish then a stronger solvent is needed. Please note that it needs to be a solvent that will not remove any finish! The cleaner available from Hans Weisshaar is an excellent cleaner of rosin and safe for nearly all finishes. However it is fairly costly. Really old built up rosin requires old- fashioned elbow grease, rubbing the cleaner in small circles until the finish is free of dull spots. Once the rosin is removed the instrument can be polished with glowing results. The Bow– For beginners the bow is an under-appreciated accessory to the instrument. Advanced players appreciate full well that the instrument is little without its essential counterpart – the bow. The most important thing to remember about the bow is that it needs to be loosened when it is not in use. Loose means that the screw at the end of the bow is turned in a counter clock-wise direction until the hairs just start to separate from each other. It is also important that the bow be secured in the case, having it rattling around inside can cause damage to instrument and bow alike. Rosin does not need to be applied until the dust is flying all over the place; it needs only enough to produce a solid even tone. Lastly, watch where you put your bow, secured in the bow holder in your case or in a bow case are the only truly safe places for a bow. On a bed or soft chair are bad ideas because it could be forgotten and sat upon. The music stand is also another classic horrible place to put a bow. Music stands are not long enough to hold a bow without one or both ends hanging off the sides. These exposed ends are then open to all kinds of blows from a whole variety of sources that can cause irreparable damage. Carbon fiber and plastic bows are more forgiving than wood bows but not indestructible.